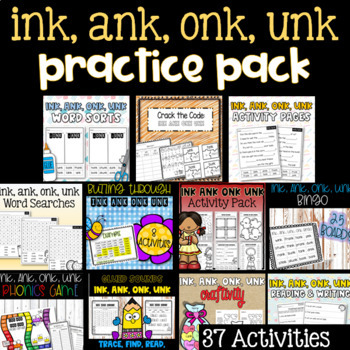 GLUED SOUNDS (ink, ank, onk, unk): Grab these SIXTEEEN (no prep) phonics based worksheets! Students practice reading, sentence writing, alphabetical order, decoding, writing conventions, spelling, and sorting words with the glued sounds ink, ank, onk, unk. -8 Buzzing Through Words: Students highlight a trail of glued sounds to help the bee reach the flower. See thumbnail for highlighted example. -4 Reading Cut and Paste: Students read sentences with a missing word. The cut and paste the correct words into the sentence. BONUS: Each word sort features an ABC order early finisher page on the back. 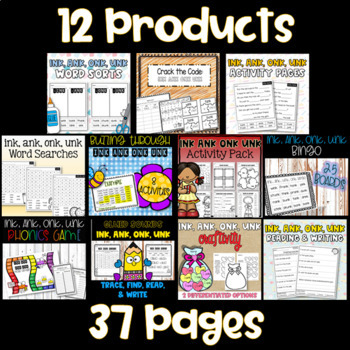 -2 Proofreading + 1 Sentence Writing Worksheets: Students read prompted sentences with glued sounds. They rewrite sentences correctly using capitalization, punctuation, spacing, and neat handwriting. On the third page, students write their own sentences with prompted words. -1 Crack the Code Puzzle: Students 'crack the code' and sort words together with pictures that match their initial sounds. See product preview for more information!